Years ago, running a mail order business with hundreds of products out of a small outbuilding behind my parent’s house, my father devised an exceptionally cheap method for quickly building highly compact, highly organized storage. Although it’s admittedly not at all nice to look at, this system will store thousands of small products in a very small footprint for a very small investment. 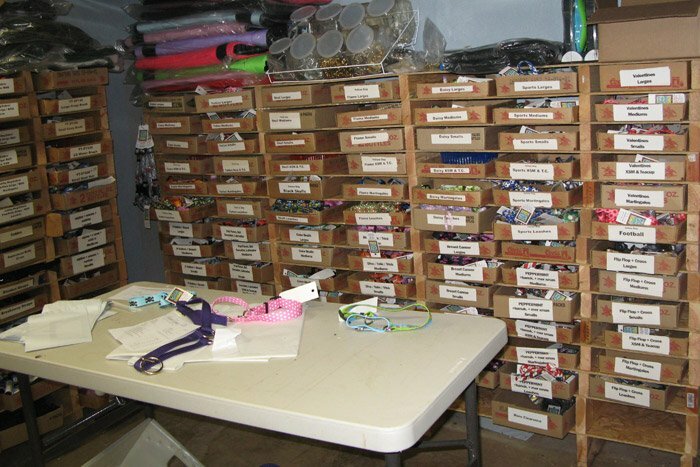 When I started a retail business at 22 this was the storage system I used to hold product as my online business grew. When, at 29, I moved into a retail space, I rebuilt a version of these shelves that, with just a bit more time and money invested, created storage that was cheap, dense, and not at all too rough to look at (see black & white warehouse shelving, below). Beer-flat boxes and 2×4’s combine with plywood strips to create this storage solution. It’s perfect for when you need to store and organize a large amount of small items in a small footprint on a shoestring budget. Choose supplies. These shelves are highly variable. Thin plywood and lowest quality 2x4s are functional, but high quality plywood resists sagging when storing heavier items and thinner supports, though more expensive, increase the amount of space available for storage. Have your home supply store cut the plywood strips for you. If you plan to paint your shelves, do it at this point- before construction- while you can still paint large sections with a roller. 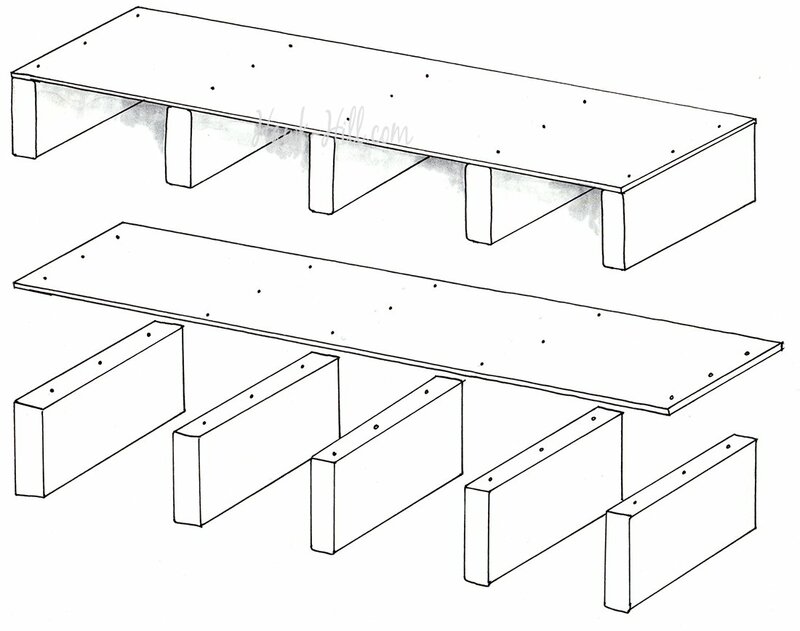 Alternate supports and plywood, using exact measurements so each support beam is screw into the exact location of the support beam on the shelf beneath it. Supports placed askew will make shelves sag and possibly fall. Place shelving units one on top of another and add a support board at each end to secure each shelf in place. This image illustrates how short boards (2×4’s, for best value) are used to support plywood strips. Screws and stacked properly, these shelves go up quickly for low cost and can store thousands of small parts or inventory pieces in a footprint no larger than 2’x8′. It’s important each support board is placed in the same place on each shelf. The heavier your load the more important this is. Worth noting, the system is highly variable. When storing heavy products (hardware, etc) you’ll need many more support than if storing lighter weight items. 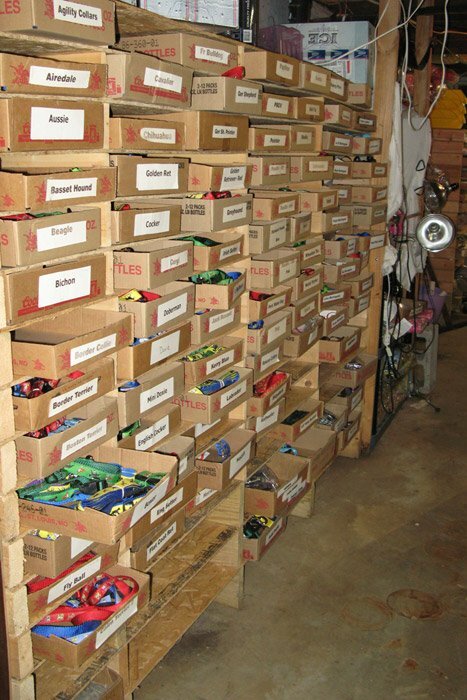 This system makes quick work of organizing a small store of product inventory or works great in a workshop to catalog small tools and hardware items. Modified to use 1×6’s, lots of paint, trim, and white bin boxes these shelves can create a retail display grade appearance. 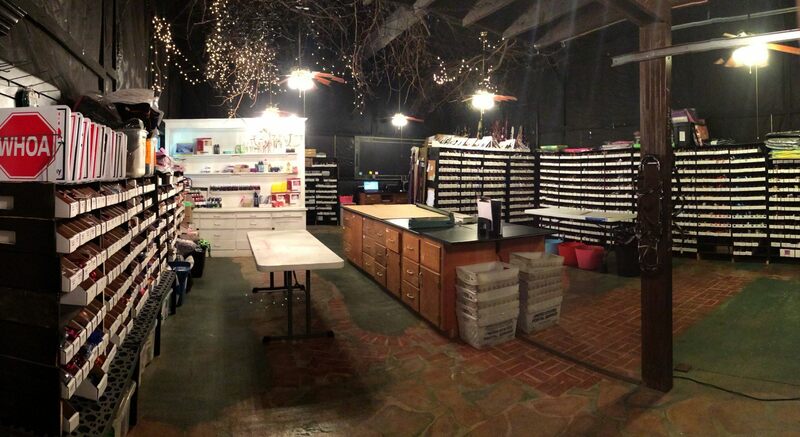 This storage system helped provide cheap storage while my previous retail business (now sold, as I’m off on new adventures) grew from a fledgling side business in my basement, where looks didn’t matter, to a larger retail business in it’s own brick and mortar shop. At the latter location, we dressed these up by adding spacer boards, trim to the top, and painting them to match the wall color. The trim and paint really helped these shelves look like they were professional built-in shelving. In the photos of the black shelving you’ll notice we switched from free “beer flats” to white bin boxes. 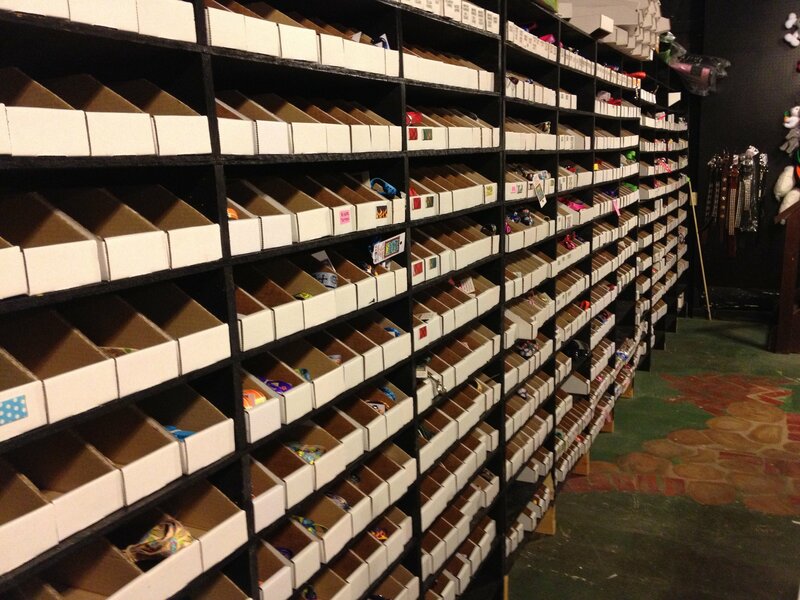 Initially a not-small investment for the thousands of boxes shown in this picture, we were really pleased with the professional look of the black shelves and white boxes. Additionally, the corrugated bin boxes ended up being much more durable than the beer flats we initially used. When pulling parts or inventory for orders, you pull the box by the front lip. For can flats this often meant the front lip broke after a few months for popular or particularly heavy items, with the bin boxes there’s more reinforcement on a narrower section of the box, so the bin boxes looked newer, longer. In fact, in the 3 or 4 years we used bin boxes, I can only think of a few occasions when a bin box needed to be replaced for that reason. TIP: It’s helpful to decide what kind of boxes you will use BEFORE you build your shelves. You can use the boxes as guides to help you determine where to place supports. Remember to add more supports (for example, every 12 inches instead of every 24 inches) if the items you will be storing are heavy. DIY high-volume small warehouse shelving for small businesses. Larges always at the top, smalls at the bottom, with descending sizes in between. 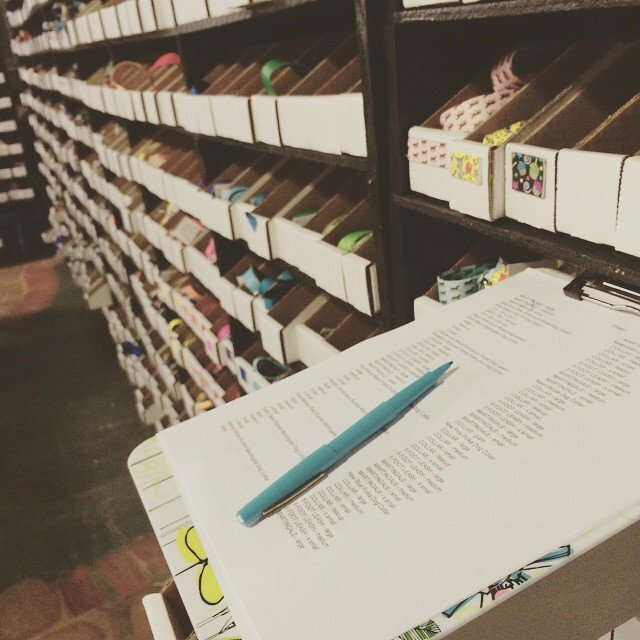 Visual Labels (such as a snippet of the pattern) on the box, instead of word tags, that labeled a whole column. It was interesting to note that each time I hired a new employee to help with shipping I’d begin relabeling product boxes, but inevitably they’d memorize the geography of the warehouse before I’d finish. I’m sure that as a perk of operating a small warehouse that would not transfer to a larger location. We liked bin boxes because we could see box contents as we were pulling items for orders. 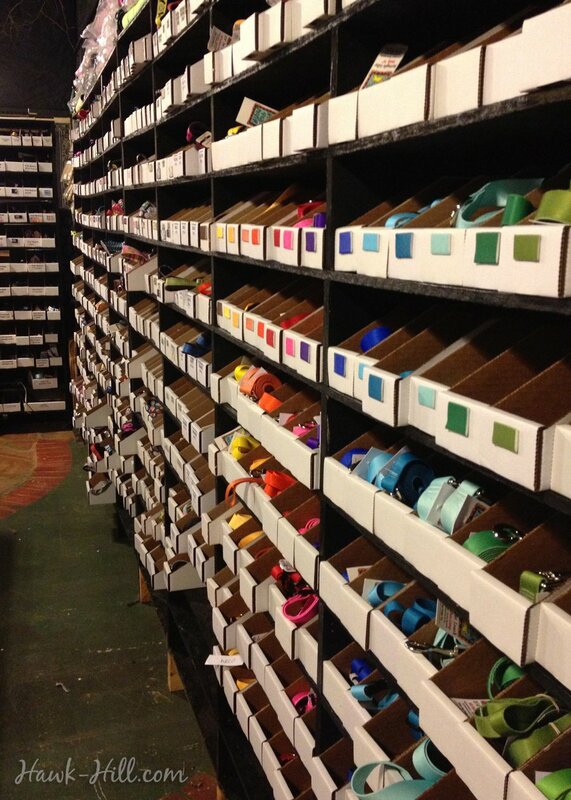 Color swatches were added to help accuracy in order fulfillment for our small business. In this closeup you can see where the 1×6 supports meet the plywood shelves. 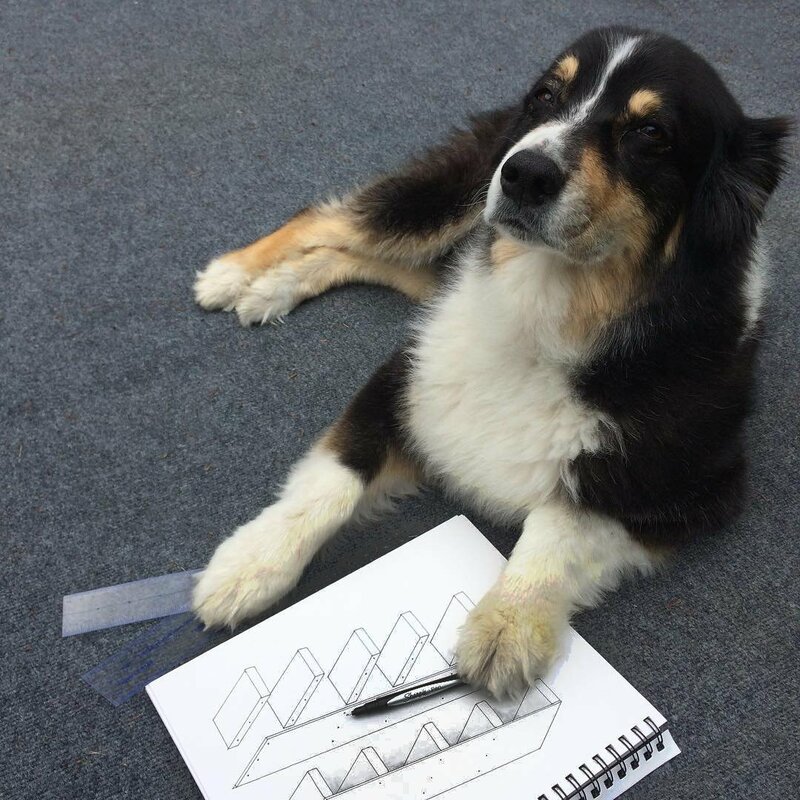 My Australian Shepherd architectural design consultant friend said the schematics work!